I was the typical super creative and dreamer child, with a wild imagination! I liked to play with conventional toys but….I liked most to play with the ones “invented by me”. When I was really young I started to draw (actually….retracing Mickey Mouse books), or…another of my pastime was to re-create the planimetries of the tv shows I was used to watch (I should still have the planimetry of the house of Brandon and Brenda Walsh or the cafè of “Saved by the Bell” somewhere…. During my Art High School I also discover a passion for paintings and for a small period I was used to withdraw in my “studio”…painting my plywood covered by acrylic colors, sterile gauze pads, vinyl glue and stylized animals and human figures! At that time I had no idea of what this was about, yes of course…I watched all the Disney classic movies but I never thought to became an animator… but … I decide to apply for the course! And then…the last one: the preparatory course, some days in the school with the other students to test our skills and attitudes! Finished the school I went back home and I started to look for a job opportunity. 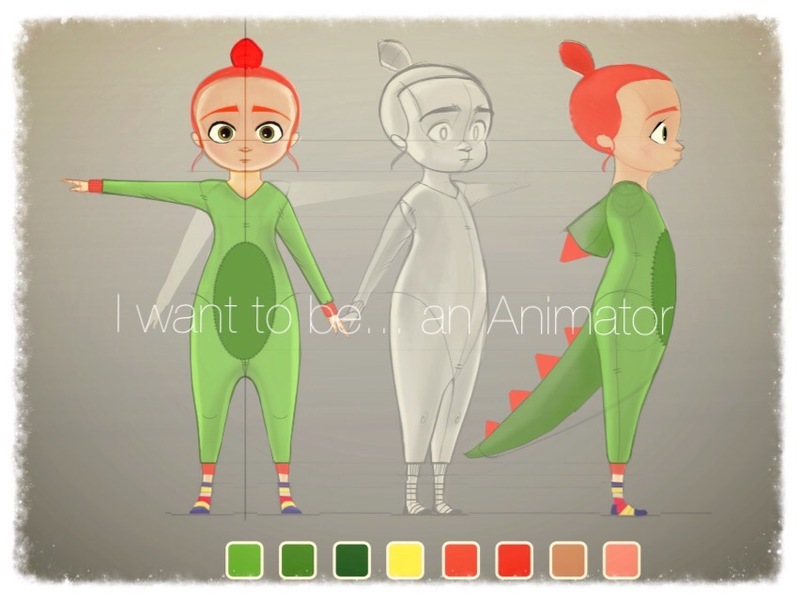 I live in a small town, in Tuscany, and I found an animation studio in Pisa, around 1 hour by train, that was looking for animators for a tv series. I was a bit hesitant, I didn’t feel ready to work as animator (my skills were really poor ’cause in school I focused much more on other aspects of production) and the supervisor of the studio was an animator with 20 years of experience in dreamworks… I definitely was a bit scared but….I accepted the offer! The protagonists were: a crow, a penguin, a bat, a flamingo, an hummingbird, a lady owl, a woodpecker, a blackbird and 5 ducks! They fly around the world on a zeppelin to save other animals who need their help! But… I won the challenge and I animated the series for 6 months with an amazing team of talented animators! The challenge here was setted a bit higher: characters with no voice, no mouth or eyebrows, no arms… but… it’s still absolutely the project I loved most! Unfortunately the production dealt with some problems and the movie was stopped. But I still have a good memory of that experience! So, I went back to the studio in Pisa for the Second Season of “Taratabong”! I moved there and I started the production of another Animated Movie “Gladiator’s of Rome”. Set in the ancient Rome, it tells the story of a unusual gladiator! Awesome team, funny moments to remember! I had the chance to apply in a very big company based in Hamburg, GOODGAMES STUDIO in the extreme north of Germany! Right now I work as freelance for other italian and foreign studios, and in the spare time…I have this blog! Responsible for the in-game animations of the 3D characters of “A Little Lost” – puzzle game. In my role I had to deal with: set a workflow and the animation style, deliver animations for most of the characters in the game. In addition, I was responsible to guide and supervise other animators. I came back to Italy after the French experience and I worked for several months on the second season of this successful tv series, a Germany / Italy coproduction. I took care of the layouts, and I also animated the transformation of the protagonist. Moved to France for a year, in Angouleme in the region of the Charante, I worked on the most challenging (but really funny) series in my career, the 3D tv series “Foot De Rue Extreme” (produced by Télé Images Productions). Here’s the fantastic ANIMATION TEAM I had the honor and the pleasure to work with, here in Angouleme. The Winx are a well-known successful product and, in the fifth season, it was introduced the computer graphics, that we animated! Full in love with Meloditties! Animate characters with no voice except for “music” sound was so challenging and interesting! I learned a lot, especially how to give life to characters just through eyes and “timing” and how to animate following precise beats and rhytm of the shot! Thanks to this experience and the people in the studio that believed in me, I discovered my “talent”.